Fabreeka International has a leading role in providing vibration isolation systems and design techniques to meet the increasing demands of automotive and aerospace testing in simulated environments. Solutions for auto testing include the design of test equipment support foundations (reaction masses) including structural and dynamic analysis. 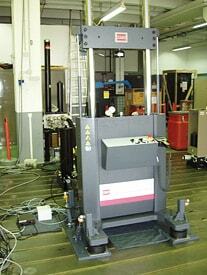 Applications include dynamometers, rolling roads, road simulators, multi-axis shaker tables and other test equipment. When performing testing of large spacecraft or hardware that will be launched into orbit, it is necessary to conduct the tests in a space-simulated environment. To achieve this, a vacuum chamber or thermal vacuum chamber is used, which creates an environment to simulate the pressure and thermal effects of space travel in orbit. It is necessary to decouple the spacecraft/payload from the chamber using vibration isolators to attenuate environmental vibration from the testing. In some cases where feasible, the entire chamber with payload is decoupled from the test facility. Additionally, Fabreeka provides isolation solutions for material testing machines including tensile, compression and fatigue testing equipment that can create vibration and shock.